Durably laminated classroom maps measure 46" x 32" or 36" x 48" and are mounted on a roller with backboard. 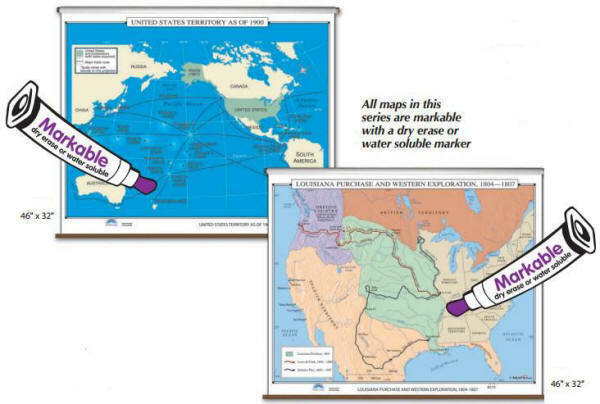 All maps in this series meet US history curriculum requirements. Save money and space by mounting History Wall Maps together, as a set, on one spring roller-mounted wall map operation. This product is ideal for public, private, parochial, and home schools. Wall maps can be ordered as sets or as single rolled maps. If ordering a set, please indicate map item number and title in the Special Instructions Section of the secure Shopping Cart. 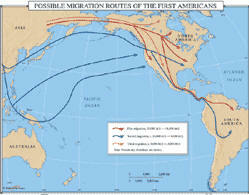 Visually trace the colorful arrows identifying the Possible Migration Routes of the First Americans, originating in Asia they work through North and South America during three historical periods: 35,000 BC - 18,000; 10,000 BC - 4,000; and 8,000 BC - 3,000 AD. 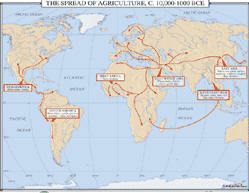 Wall map identifies five areas of the world’s agriculture and where it spread. 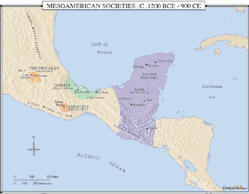 Includes Mesoamerica; South America; West Africa; Southeast Asia; East Asia; and Southwest Asia. 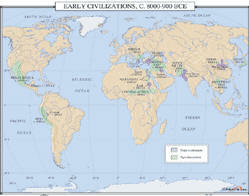 Wall map identifies major civilizations and agricultural areas of the world from 8000-900 BC. 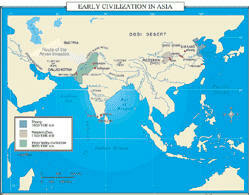 Includes areas like Mesoamerica, Peru, Greece, Middle East, Central Africa, Indus Valley, China, Japan, and Southeast Asia. 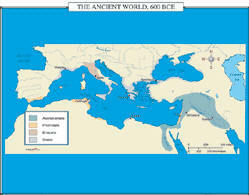 Wall map was made up of four major groups: the Assyrian Empire, the Phoenicians, the Etruscans, and the Greeks. 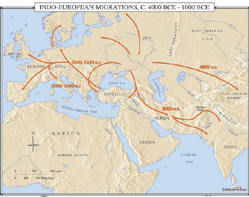 Wall map shows people movements through the European Continent, Eurasia, Asia, and India during the Bronze Age. Wall map identifies four major areas: the Hittite empire; Mesopotamian empires, areas of Mesopotamia conquered by Hittites, and the Egyptian empire. 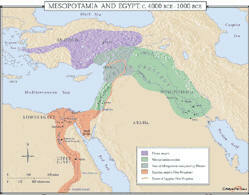 Also shows the extent of the Egyptian New Kingdom. Wall map shows the land areas during the last glaciation, the present day shorelines, and the routes of Austronesian migrations. Focuses on current day land areas of Australia, Indonesia, and New Guinea. 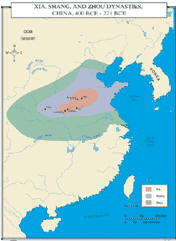 Wall map shows Shang, from 1500-1100 BC; Western Zhou, 1100-1000 BC; and the Indus Valley civilization, from 3000–1000 BC. 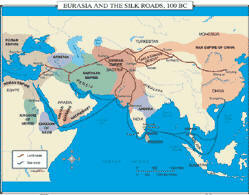 Also includes the route of the Aryan Invasion, Ceylon, Baluchistan, and the Gobi Desert. Wall map illustrates the Mycenaean society in what is now Greece and the Minoan society of modern day Crete. 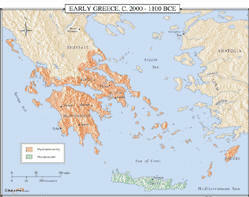 Also shows the areas of Boeotia and Peloponnesus along with several cities such as Athens, Sparta, Thebes, and more. Wall map uses color-coding to separate the Teotihuacan, Olmecs, Zapotecs, and Mayan societies. Wall map focuses on Christianity, Buddhism, and Hinduism; and shows movement throughout Europe, the Middle East, Eurasia, Asia, and India. 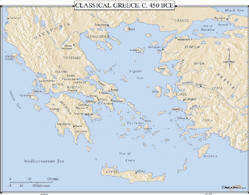 Wall map includes Macedonia, Chalcidice, Thessaly, Arcadia, Thrace, Persia, Crete, Lydia, Ionia, and more. Wall map shows the locations of each of China's three major dynasties in vibrant color. 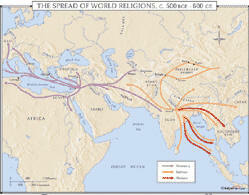 Map includes a large section of Asia including the Gobi Desert and Korea. 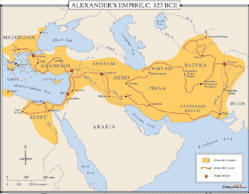 Wall map traces Alexander's route throughout the empire and pinpoints major battles. 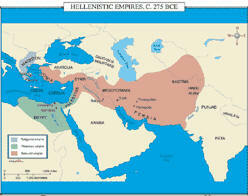 Includes areas in Macedonia, Asia Minor, Armenia, Media, Parthia, Persia, Bactria, and Egypt. Wall map shows the three empires - Antigonid Empire, Ptolemaic Empire, and Seleucid Empire - and includes land areas in Macedonia, Ionia, Syria, Mesopotamia, Persia, Bactria, Egypt, Palestine, and others. Wall map identifies the silk trade, traversed by land and by sea; the empires involved; and the trading routes, as they traveled from the Han Empire of China to the Roman empire in Turkey and the Middle East. 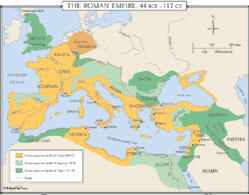 Wall map shows the progress of the Roman Empire over time. Lands acquired in three distinct periods are illustrated using coloration on a map covering Western Europe, North Africa and the Middle East, with a detailed inset showing Italy itself. Time periods featured are: 44B CE-Before the death of Caesar; 14 CE-Before the death of Augustus; and 117 CE-Before the death of Trajan. 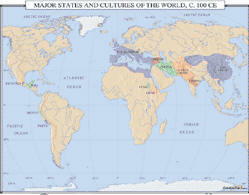 Wall map identifies some of the major states and cultures of the world as of the year 100. 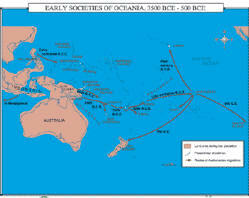 Includes North America, South America, Africa, Europe, Asia, Australia, Roman Empire, Armenia, and Central America.